After Zoe Beavis gave birth to twins in May 2017, she put both of their names on waiting lists for the two licensed daycares in Vancouver that fit her working hours. One year later, her twins still hadn’t been accepted into either facility and she was planning to return to work. She had to hire a private nanny instead — a form of care that was easier to obtain, but at a high expense. Situations like Beavis’ are all too common in Vancouver. 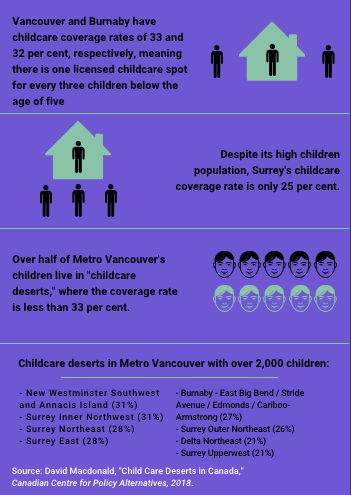 According to a study by the Canadian Centre for Policy Alternatives, over half of Metro Vancouver’s children live in areas considered “childcare deserts,” where there are at least three children or more per licensed daycare spot. Paul Kershaw, a UBC population and public health professor, pointed to changing patterns in Vancouver’s working families as an explanation..
“Demand for child care from the population has changed dramatically over the last several decades in conjunction with the rise in female labour force participation, dual earner households, lone parents, etc.,” he wrote in an emailed statement. Due to this shortage of licensed spaces, many new parents are hiring private caregivers instead to provide childcare for their kids. However, the cost of one can be a heavy financial burden. When Dana Ramnarine began looking for childcare for her son, she also came across years-long wait lists and realized she would have to hire a nanny. “I didn’t really have any options,” she said. The only places for her to find one were through nanny agencies, which were expensive, or through Craigslist, which she didn’t trust. 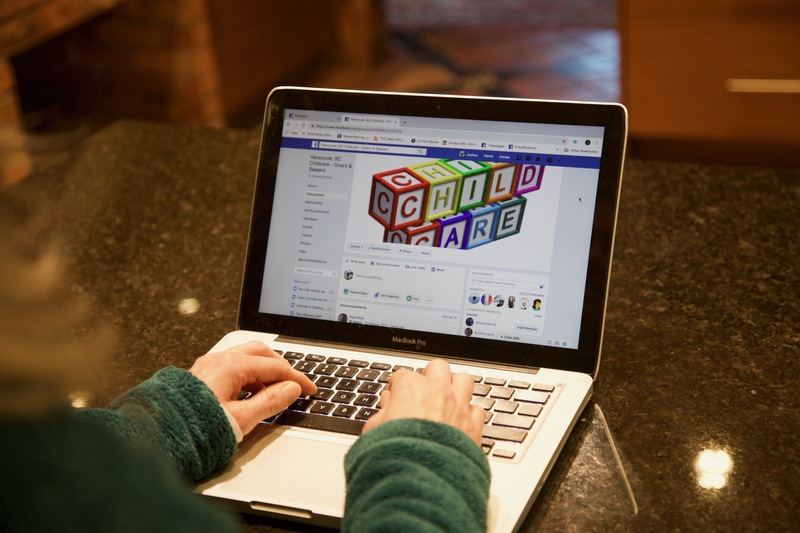 She created a Facebook group titled “Vancouver, BC Childcare – Givers & Seekers,” where parents can request childcare and caregivers can advertise their services. Her group has amassed 20,000 members in four years, and the feedback has been positive from both parents and caregivers. “A lot of caregivers come to me and say, ‘I don’t use anything else to find work now other than this site,’” said Ramnarine. 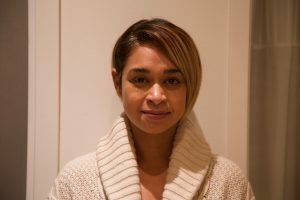 To manage affordability, Ramnarine and many other parents in the group have entered into nanny-shares, where a nanny will watch over two children from separate families, often at the same time, and parents split the cost. “It’s so much less expensive than, say, paying a nanny at 20 an hour or higher,” said Shawna Palm, a nanny who has worked in Vancouver for over 20 years. It’s also beneficial for the nanny because the cost-splitting incentivizes parents to pay them a higher combined hourly wage. “We live in such an expensive city that typical private care wages are sadly below a living wage,” said Palm. “I started nanny–sharing purely out of the fact I needed an income I can live on. However, nanny–sharing has its limitations. A nanny who is taking care of children from two families is only allowed legally to be in charge of one child from each family, so it wasn’t an option for Beavis’ twins. Additionally, hiring a private caregiver or entering a nanny share isn’t an option for parents who can’t afford it. Erin Carrasco, a single parent, does not have the funds to hire a nanny or enter a nanny-share, but she is eligible for government subsidies that can cover most of her childcare costs if she can place him in a licensed daycare. She was planning to return to work in December but had to postpone her return when her son’s daycare spot was unexpectedly dropped due to a staff shortage. She managed to secure another daycare spot for him at the last minute, but the crunch to find one was tough. A shift to universal childcare? Earlier this year, the B.C. government announced a $1–billion investment into creating a universal childcare system for the province that includes supporting the creation of 22,000 licensed childcare centres over the next three years. To address affordability, the B.C. government also increased the amount of parents eligible for subsidies and launched a pilot project for $10 per day childcare, which was announced in early November. “The reason why we want it invested in is because parents have been really struggling for years looking for childcare services and early learning services,” said Katrina Chen, B.C. minister of state for childcare, in a phone interview. “It’s really making an impact on their ability to, for example, decide to continue to work or go to school or [make] other important choices in their life. In the meantime, parents will have to adapt to the financial crunch of private alternatives.